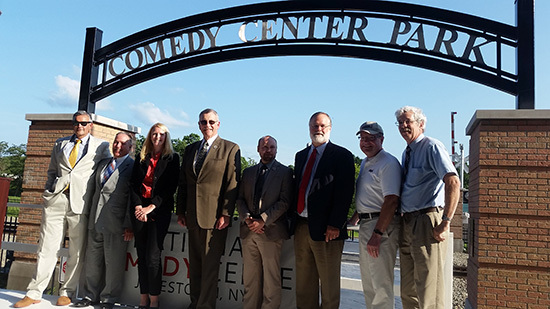 (L to R) Tom Benson, National Comedy Center Chairman; George Panebianco, Comedy Center Board President; Journey Gunderson, Comedy Center Executive Director; Dan Herzenrater representing Congressman Tom Reed; Deke Kathman, Carnahan-Jackson Foundation; Randy Sweeney, Chautauqua Region Community Foundation and Andy Goodell, NY State Assemblyman. “This is the first tangible segment of fulfilling Lucy’s dream,” Tom Benson, National Comedy Center Chairman, told a packed trackside platform of well wishers, proud organizers, community leaders and workers on Thursday afternoon, July 2 to see the unveiling of the new archway over the pedestrian track crossing at the historic Jamestown Gateway Train Station. Benson noted that Lucille Ball had always been pleased with the idea of a museum dedicated to her life’s work, but her fondest dream was to help develop the careers of passionate, young comics and to see the creation of a national center for the celebration and performance of comedy in all its forms. “The Gateway Train Station will always be a part of this attraction,” Benson said. It will always be available and will even feature future improvements including a full catering kitchen. He reassured Jamestown residents of Gateway’s ongoing importance as both a public transportation hub and a community center for activities of all kinds. Benson congratulated Stationmaster, Lee Harkness, for his tireless work at the Gateway Station. The newly landscaped park grounds between the Gateway Station tracks and the river were noted by all speakers as a wonderful and scenic improvement of the old track yard few had thought could have ever become such a beautiful attraction. Executive Director, Journey Gunderson, congratulated all of the members of the Comedy Center’s Board of Directors for their work, expressed great optimism for the future completion of the entire Comedy Center Project and thanked the entire Jamestown Community for their faith and participation in the ongoing work.